As the Canadian federal election campaign enters week two, the government of Israel has launched a campaign to slander, disrupt, and possibly attack the upcoming Freedom Flotilla to Gaza, which will have many Canadians aboard the Canadian Boat to Gaza. Israeli Prime Minister Binyamin Netanyahu has now threatened to “act firmly” using “force” against the flotilla in May. The Canadian Boat to Gaza is calling on all of the federal parties to denounce these threats against Canadians by Israel, which has demonstrated its willingness to use lethal force against civilians, similar to its fatal attack on last year’s freedom flotilla. Prime Minister Netanyahu has falsely claimed that the Flotilla is being organized by “radical Islamists” intent on smuggling weapons into Gaza by sea. With support from coast to coast, the Canadian Boat to Gaza has raised over 80% of its fundraising goal of $300,000, and enjoys the endorsement of organizations representing hundreds of thousands of Canadians. Retired federal politicians – including Warren Allmand and Raymond Gravel – support the initiative, and the Canadian Boat to Gaza is calling on politicians seeking election to do the same. Many notable Canadian and international figures have already endorsed the Canadian Boat to Gaza, including Denis Halliday, former UN Humanitarian coordinator in Iraq, Amir Khadir, Quebec MLA, Maher Arar and Monia Mazigh, writers Judy Rebick and Linda McQuaig, Noam Chomsky and Norman Finkelstein, to name but a few. More than 100 civil society organizations – trade unions such as CSN in Quebec, Christian, Muslim and Jewish groups, campus and community organizations, as well as non-governmental organizations – have lent their support to the mission. 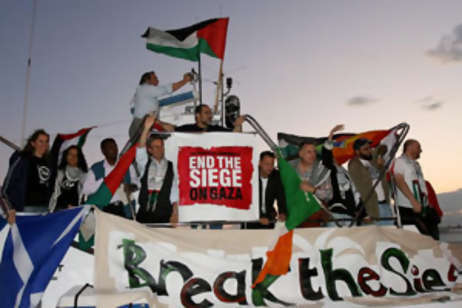 The international Freedom Flotilla II, coordinating the efforts of groups from all over the world (Canada, Spain, Switzerland, Italy, Ireland, USA, UK, Greece, Turkey, France and others) is planning to sail to Gaza in the second half of May 2011. Israeli Prime Minister Binyamin Netanyahu also asked UN Secretary-General Ban Ki-moon to help him stop the Freedom Flotilla from arriving in Gaza in May. The Secretary General responded saying that Israel should end the blockade of Gaza. Contact your MP – here.